Colville Farm Holidays, - Escape the hustle and bustle and visit Colville. Our location is 30 minutes drive from Coromandel township and 3 drive minutes from our quiet country settlement of Colville which has a General Store with all your basics and 2 cafes as well. 1-hour drive to the start of the coastal walkway at Fletcher Bay. Fully Self Contained cottage with most of the comforts of home with an open plan kitchen, living and dining area. If fishing is more your thing go off the rocks along the coast towards Port Jackson Or bring your own boat and launch at Amodeo Bay. Tramping choices on the farm range from 1 to 6 hours - through bush, grassland and up into the mountains for amazing views. Colville General Store has most supplies including bait, ice, alcohol petrol and diesel Colville General Store may be closed if arriving after 5 pm. Colville Farm Holidays / White Star Station is on a 1,260 hectare sheep and cattle farm. It is now operated by Karl and Tellic Evans, it has been run by the Evans family since 1864. We are the 7th generation. We love this farm and enjoy the opportunity to share it with you. When it is warm enough for you swim In the creek 150m away, the hot days can be spent paddling in the shallows, building dams and spying fishlife eels and koura (freshwater crayfish) Further upstream swimmers can jump off the bank and swim in the 3m deep hole. More swimming can be done at the waterfalls too - 3 of them - lovely native bush to walk through. 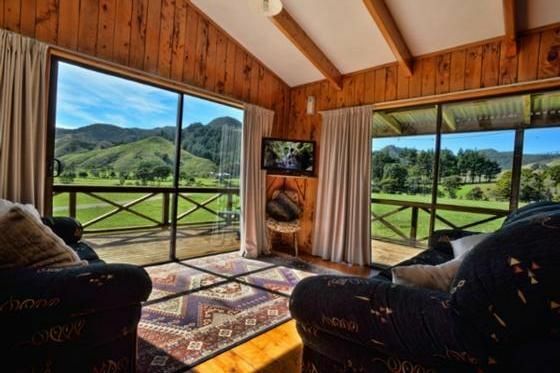 Tramping choices on the farm range from 1 to 6 hours - through the bush, grassland and up into the mountains for amazing views of the Pacific Ocean and Hauraki Gulf. (Detour to an old goldmine for close-ups of glow worms too) Maps available Onsite Guided Horse trekking is available (Bookings essential) Horse riding caters for all abilities, From 4 years old! - walk, trot or canter along the grassy flats, through creeks and paddocks of cattle then up into the foothills for the views on the way home - beach rides available too depending on the tide. We used the cottage to gather the family for a weekend break, and it was ideal. Clean, tidy, in a beautiful and peaceful setting. We were surprised how isolated Colville was, but the accommodation was very good with everything we needed plus extras. It was comfortable and we enjoyed our stay. Great place to stay and explore. A tramping trail system outside your front door, a creek to cool in, and horses on sight to rent. Perfect stay. Everything you need and more. We loved our stay at the Farm Cottage, the house was homely and clean. The dogs loved the bush walks and space to run. We will definitely be back. Thanks so much. Bush e Bikes - is a bike hire and cycle tour business run by Gavin and Leanne Jeffcoat, located in Coromandel Town. In a new and exciting move, we are pleased to announce we have purchased the Coromandel Discovery bespoke touring business which specialises in minibus tours to the Coromandel Coastal Walkway. Between the two businesses we are confident we can help you explore our beautiful backyard and know you haven't left a stone unturned. Our fleet of quality electric bikes offers a range of approx 45-60 kilometres (per battery) so you can visit many of the awesome sights on offer, with much less effort than a standard bike. However if you prefer a bit more exertion, we have added ten quality Avanti Competitor mountain bikes to our fleet.